In this first edition, Dr. Rosen discusses the impact of Vertebral and Cranial Subluxations on the child's health. From this perspective he covers the complete spinal and cranial evaluation and adjusting protocols from birth through early childhood. The specific protocols are demonstrated with dozens of illustrations, charts and detailed descriptions. Included are two special chapters on the correlations and applications of the examination and adjusting protocols taught in the book, as well as some symptom specific procedures. The purpose of this book is to offer the chiropractor and student a window into the most important and satisfying aspect of being a chiropractor: Pediatric Chiropractic Care. The ability to sustain Chiropractic, and move it into its rightful place in the healthcare marketplace, is by educating the public and our profession to Chiropractic's real impact on the individual's health and well-being. The first two years of a child's life are the most influential period in the post-natal development. This is the time when 90% of their neurological foundation and potential is being formed. At no other time in our lives is the expression and development of our human potential so greatly influenced or developed. This 9 chapter 200 page book is a valuable tool for anyone wanting to create a successful pediatric practice. 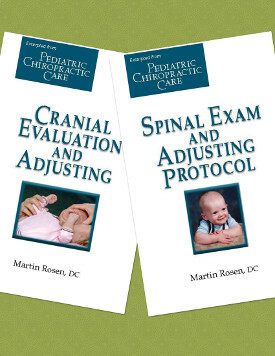 This 120 page booklet (6x9) contains all the spinal examination and adjusting protocols necessary to build and sustain a successful pediatric practice. Whether you are new in practice or have years of experience there are procedures and protocols that will offer new options for your pediatric patients. Evaluation and both low force and standard chiropractic adjusting protocols are demonstrated for the pelvis (specific sacral corrections are highlighted), lumbar, thoracic, cervical and occipital-atlas condyles. Also extremity corrections are covered to help support the spinal adjustments. This booklet is excerpts (2 chapters) from Dr. Rosen's complete pediatric adjusting book - Pediatric Chiropractic Care. This 120 page booklet (6x9) contains all the cranial examination and adjusting protocols necessary to build and sustain a successful pediatric practice. Whether you are new in practice or have years of experience there are procedures and protocols that will offer new options for your pediatric patients. There are CSF directing techniques, specific cranial bone corrections, sphenobasilar corrections as well as techniques that can be used for specific clinical presentations common to the pediatric practice. Intra- and extra oral corrective procedures are included. This booklet is excerpts (3 chapters) from Dr. Rosen's complete pediatric adjusting book - Pediatric Chiropractic Care.